The past month has been good for reading (and book shopping with Christmas money), but not so good for writing – reviews or anything else. But with the first weekend of the new year I am heading back to more regular routine. And yes, it may seem odd that I am publishing a review of a Christmas themed story after Christmas, but I find it odd how quickly we abandon all things Christmas by the evening of the 25th, as if we can’t wait to move on from what is supposed to a pleasant time. 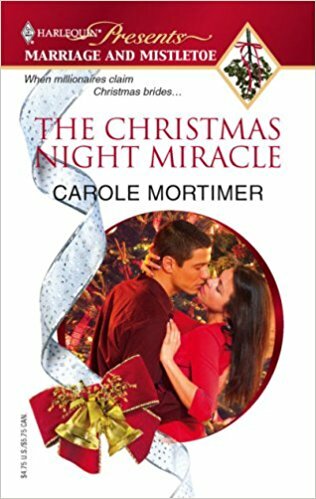 The Christmas Night Miracle is a 2006 Harlequin from Carole Mortimer. It’s from the Harlequin Presents line, specifically a series called Marriage and Mistletoe. According to Harlequin, Presents is “alpha males, decadent glamour and jet-set lifestyles,” but it wasn’t that way in 2006 – at least, not in this story. Jed has written several best sellers, and his last brought fame, but now the pressure is on to produce another masterpiece, and he’s spent the last few months in a borrowed English cottage, fretting over writer’s block. Meg knows of him, but does not recognize him when they meet, in part because of the circumstances, and in part because he does not use his full name when he introduces himself. He’s avoiding publicity, and the last thing he needs is a young single mother and her three-year-old, stuck at his cottage for the night. He’s attracted to her, but dismisses that as a natural result of his forced social isolation. Then he hears Meg’s peculiar conversation with her mother. The next day, roads are clear enough that Jed can drive Meg, in his luxury SUV, to the country estate home of her parents. He stays, partly due to worsening weather, partly to protect Meg from her cold and mysterious family, and partly due to the power of a few kisses. Throughout the day, Christmas Eve, his attraction to her grows, and his puzzlement over the family situation increases. That night, he’s inspired to outline his next novel, and Christmas day brings a series of revelations, and a proposal. From meeting to proposal in just a few days is very quick, and yet it seems to work for this couple. Perhaps it helps that money is not something this couple has to think about. Though Meg does not live in luxury, she does not have money concerns either, and her family is wealthy. Jed is living a relatively quiet and simple (non-decadent) life, and he is not far from his farming family roots, but a couple of references to his “homes all over the world” remind us that he is wealthy (and is perhaps a nod to the jet-set lifestyles concept of the series). It also helps that he is a celebrity, as opposed to a stranger, and he sees her almost immediately in her childhood home and with her family, so there are some shortcuts to the ‘getting to know you’ phase. While they meet in unusual circumstances, both are mature and stable, and they have the ideal situation of not actually needing a partner, but recognizing that are better together. Multiple reminders of mortality also encourage moving quickly. Then there are the many heartwarming elements. Winter stories naturally introduce cozy scenes of snowman building and hot chocolate around a fire, and even those of us who recall too many outings where we or the kids are quickly frozen, tired, and otherwise miserable are susceptible to these scenes of what is theoretically possible. On top of this we have multiple family reconciliations (theoretically possible), and some impressive displays of family support and selflessness (also theoretically possible). So, strong characters, who are flawed and down to earth, thus likeable and sympathetic despite their wealth, and a fast paced narrative with sweet romantic tension, that hits a lot of heartwarming notes. There is a lot to like here. On reflection, it might have been nice to know more about the couple. For example, the story focuses on short-term issues, and I wouldn’t mind knowing more about our couple’s long-term goals. That could increase my confidence that this will be a lasting relationship. However, the sub-plot mystery of how Meg became a single mother adequately distracts from weaknesses in the romance plot. And there’s no mistletoe kiss cliché, thank goodness.